East Lancaster resident Mary Tyson snapped this recent photo of her neighbor’s pit bull jumping at her backyard wall. Tyson said she narrowly escaped an attack in June. Tyson fears the dog will jump over the fence again and then escape into the neighborhood and harm children. She is calling on animal control to warn her neighbors about properly containing their dogs. I am submitting this issue to raise awareness about irresponsible dog owners. We have been asking our neighbors for a year to properly contain their pit bull. This dog is located in the area of East Avenue K and Challenger Way in Lancaster. This dog will jump and lunge nonstop to an obsessive point. 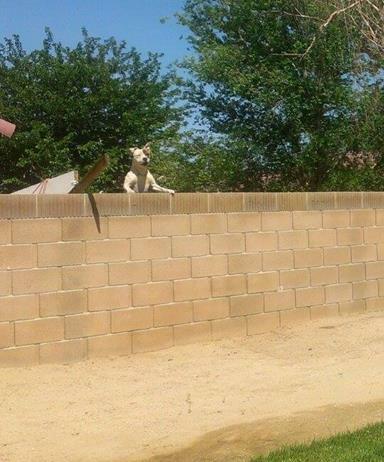 The pictures are of the dog jumping at the wall in my backyard. If she comes into my yard, then she can escape into the neighborhood. It will only take one time for someone to get seriously hurt. In April, our neighbors informed us that the dog has never gotten out and that they do not lock up their dogs. That month, we were also woken up by yelling. When we entered the back yard, we were told by the owners that the dogs were fighting over food. In June, the dog lunged over the fence and I literally had spit on my neck. They bought a kennel after hearing how I felt about almost being bit at 1 a.m. Because they bought the kennel, I cancelled the call I had put into animal control. This picture shows a kennel that is not being used, Tyson said. I am an animal lover and do not wish to see them lose the dog, but now they do not lock it up at all. Animal control said they reactivated my June complaint on September 4. On September 8, I called back and was told there was no record [of my complaint]. I’ve called just about every day [since then] and still no response. I spoke to a supervisor on Saturday, Sept 14, and was told an officer would respond to my house to view pictures and video. As of 7 p.m. that day there was still no response. I was told by an operator that she did not have a log of an officer responding and to call again in the morning. I called at 9 p.m. on Sept. 16, and they said they did respond on Sept. 14. They said if the dog is still jumping over the fence, they would start another call. So here we are again waiting for a response from animal control. Meanwhile, we’re left waiting for the dog to slip over or just attack. The owners claim the dog has never escaped, but judging by the way they’ve blocked the fence to the front yard, I don’t believe that. I would like animal control to respond and make sure this dog is properly contained at all times. I would like to safely enter my own yard at all hours. I would like to have my 2 and 3-year-old nieces play outside safely. I would like to unplug the Taser I have at my back door. We just adopted a pit bull mix in August, and we went through an interview to make sure we were suitable. Maybe someone should interview my neighbors to see if they are suitable to keep the dogs they have. 93 comments for "Resident warns of pending dog attack, irresponsible owner"
If they’re not going to kennel it, the dog owner should have to install additional fencing (about 1.5 – 2 ft) on top of the back wall which is angled in towards their yard at about 45 degrees. That would help prevent their dog from getting over, and be cheaper than the lawsuit they would face after their dog gets out and mauls someone. Mary Tyson, I admire you for speaking up. You, your dog, and your guests should be able to use and enjoy your backyard. It is not your job to get to know the neighbors’ dog and mollify it into behaving. The people who are commenting and telling you how to handle it lack common sense. Good luck. No, you are right she shouldn’t have to, but the reality is it might help the situation. One needs to sometimes go the extra mile to prevent a catastrophe from happening. It can’t hurt and it could really help. And risk the dog attacking her? Are you serious? Thank you very much for your kind words. I was prepared for the ignorance and decided it was worth it if it prevents an accident. The day before there was an article about the 3 yr old attacked and I felt bad for the dog just as I do for my neighbors dog. It was preventable and not speaking up would make me responsible if anything happened to anyone. Mary, first thing I’d do is buy ‘Keep Off’ and spray it on the top of the fence area if you’re safely able to when the dog is not around the fence…dogs hate it..the smell repels them, or at least slows them down…the next thing I will tell you is that if you need to call Animal Control, call the ‘Downey’ office..LA Ctys main office and get ahold of the ‘director’ or other higher ranking Animal Control official there and discuss the matter. Thank you Julie. We now have something being done. Sad you can’t even feel safe from your own neighbors dog. Sad you can’t even walk out in your own backyard. Seems like you have some bad neighbors and a dog that has learnt some bad behaviors and is obviously untrained and left alone. While I feel for the dog the potential for harm to the writer is there. Remember several of the latest maulings? AC had been called and the dogs had attacked people before. No matter what the breed this is dangerous behaviour. It’s documented. Thing is – the danger when this breed atacks is higher. And it will give the breed an even worse name. So back up this lady instead of harassing her. FFS the dog has more rights to jump over a fence than she has to sit in her own yard? Animal control is laughable. Try are more concerned with collecting fees than responding to actuall dangerous situations. I hope you get a response after this article. Remember the woman who was viciously mauled in Palmdale some years ago? The dog had attacked and been reported before. Be careful and best of luck. Thank you Foxy! I feel like I should of hired you as my spokes woman! ;) you literally took my words and expressed it the best way possible. Thank you for seeing it for exactly what it is. This forum is for AV residents to say their piece, not to talk about politics or other countries problems. I feel bad for the innocent in all these wars but I feel more sorry for Americans here and abroad who live in fear, go hungry, are ill and our government doesn’t care. So therefore, this site is made for all of us to be happy, angry or whatever and if you don’t like it, don’t come on the site. Go post on Yahoo! As far as I can tell Animal Control is worthless. 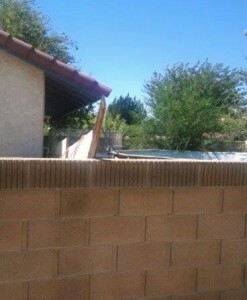 My sister’s neighbor’s dog jumped their 6 foot chain link fence while she was at work and attacked her dogs. One died as a result, and the other one hasn’t been right since the attack. This dog gets out all the time. My sister filed a report and nothing happened. Apparently the rule is the dogs have to have two violent attacks before Animal Control will remove the dogs (it attacking two dogs at the same time doesn’t count as two incidents). The other day we were over there for a BBQ and the dog once again started climbing the fence. I told my sister to get my a shovel or pitch fork because I was going to kill it. The neighbor all the sudden shows up and gets the dog off the fence. My sister put in another report, still no response. My mother also had this situation with her neighbors. The dogs kept jumping the block wall and getting in her yard. My grandmother, who lives on the property, went over there and told them if the dogs ever got in her yard again she was going to kill them herself. Problem solved. They never got in the yard again. This is irresponsible owners. It doesn’t matter what type of dog it is, all dogs can be aggressive. My chihuahua is more aggressive than my pit mix, but guess what, none of them go into other peoples yards, and they don’t jump on the fence and scare the neighbors either. When I first moved into my home there was pit bull that some how would get up on the block wall in back and bark at anyone who went in the back yard including my dog. I was so afraid it was going to jump down and attack whoever was in the yard. I went to the house and told the owner of the dog what was happening and she had her kids go out and make sure anything that was close to the fence removed so the dog could no longer be able to jump up on the fence. In another case concerning a threating dog at a rental house, we called Code Enforcement who in turn notified the OWNER and in no time problem solved. If you know the people are renters, notify the owner, they can be sited. You know they have made some effort in the past. That is why we tried to be reasonable for well over a year. I almost wrote in back in April when the gentleman was mauled by the old sheriff station, again in May with the littlerock tragedy and now the 3 yr old on Sunday. The first 2 stories had priors and it was neglect on the owners part. Even with the 3 yr old, its not fair to the child or dog they were in that position. Good news is Animal Control is acting now. I understand they are understaffed and over worked, but we felt like we were out of options. Some one call Caesar Millan the dog trainer for help and advice. He loves pits and has a way with them. He also takes them in from bad situations. The dog is probably bored and lonely. The dog doesn’t need training, the owner’s do. Mary, it’s sad you’ve had to go through this stress. Bad neighbors, for sure. Dog may be a good one. It thinks its protecting its territory. Nothing worse than thoughtless neighbors. I have Rottweilers and have triple fence and locks on all. I had neighbors who didn’t mind their kids climbing into my yard. My dogs were good, but who knows if a trespasser climbs the fences. No pound for kids. Good luck to you. Hope you get your yard back. Just stop messing with the dang dog thats what brings their attention i seen people messing with dogs latley which brings their attention. We rehomed our Great Dane, mastiff mixed cause he kept getting out of our yard. He never attacked anyone or barked at anyone, he’d get out and sit on the front porch and whine like a scared mouse if someone came near, he was more scared of others. We rehomed him, cause it wasn’t fair to him to be locked up or chained up daily. He’s in Mojave now on a ranch, miss him, but it was what was best for him and the neighborhood kids who would get scared of him cause of his size. You did the right thing Heather. It’s sad to give up an animal you love but it has to be what’s right for it, not the owner. Heather, I am so sorry you had to give up your big baby. It was very brave and responsible of you to not be selfish and make the decision to give him a better life. No matter how and why they leave us it never makes it easy. I totally agree that you should call animal control,they are not doing there job right.keep all the evidence that you have and keep a log of all the call you made to report this, because for a dog to do that its because he is protecting his territory meaning his house and family ,and if a pedestrian or someone he thinks that its a bigger threat he will jump and attack,look at what happen in little rock with the lady that was jogging and she got attacked by a dog and they killed her! that could happen again, like i said keep all the evidence and reports because I’m sure a tragedy is about to happen and you will have proof. It is hard to tell, but there appears to be a pool in the back yard. If it is dirty or unkempt, call code enforcement and/or vector control on them. When they come out and the dog misbehaves, you can bet they will call animal control. I am wondering if you can maybe try to befriend the dog? When you go out there, just talk to it let it know you aren’t there to hurt it. Try tossing some treats over the fence. I am in property management and that what I do with some dogs who like to act up. Most will learn fast I am their friend. Even the pit bulls start whining when they see me, expecting a treat and now even a nice little scratch behind the ears. You should be careful with treating the dogs as that can encourage the bad behaviors you don’t want. However, treating when they are quiet and behaving will help encourage the types of behavior you really want. Ignore the bad behaviors, treat the good ones. Just a suggestion so as not to exacerbate the problem! Yes I wasn’t clear. Treats after gaining at least some trust with the dog. Idk if u read my response below but I am a dog lover. There are many issues with the jumping. I have family & friends not willing to come over because of the risk of something happening. During the day she’s more tolerable, at night she’s protective & doing her job. I know she lunged at me at 1am because she had a job to do, just like I needed to bring my dog out. I had an issue with another neighbor feeding my pit treats, they would wedge slim jims in the fence. My dog was highly allergic to anything not fish or potatoes. Plus I’m not trying to encourage her to come over. My main point is the owners & animal control taking responsibility. Irresponsible owners are the reason why the breed gets the blame. If someone in my family or my dog gets attacked animal control is going after her and not the people who should have prevented it. if the dog learns that sounds from your yard aren’t a threat, it might keep the dog from barking at everything it hears form your area. Yes the dogs aren’t yours, but wouldn’t it better if you could at least defuse the situation a bit? Good luck on getting animal control to respond to something that is not an emergency. We had called for over a year on a stray pit bull in that was roaming the community. Then one time in another community I was nearly attacked by 2 pits who had escaped their yard. They didn’t bite me thankfully but I had to call 911. Sheriffs responded fast but it took 2 hours for animal control to come out. Sheriffs hit both dogs with bean bag rounds twice and the dogs still lunged at the officers. Bad idea. If the dog thinks that it can get treats from her, it may try harder to get all the way over the fence. Also, some dogs have food allergies. It is rare, but if she were to make the dog sick, she could be liable for animal endangerment. You NEVER try to befriend or give treats to an animal you do not know. I left out the part that one should talk to the owner, figuring it was common sense, I see I was wrong. And no she would not be liable if the dog become ill from her feeding the dog treats. There was no malice or intent to harm and since any reasonable person would not consider the act harmful, especially under the circumstances, it is not likely a judge would find on favor of the dog owner. And since a food allergy in most cases causes mild stomach discomfort and possible skin irritation, it is unlikely there would be any vets bill to recompense. Because pets are consider chattel (personal property) you normally can’t sue for pain and suffering. There are a few landmark cases where a pet was severely injured or even killed and the offending party was order to pay restitution above the actual cost of the pet. Those are rare though. @Jodice: I live in Littlerock and have been dealing with the same issue that you described of the small dog (Chixx) left outside alone (with another small dog) all night in the dark. The dog is often left alone all day as well. The neighbor keeps very irregular hours. I am trying to be patient with Animal Control’s new (long and dragged out) procedure. I just sen in my 3rd email after the original complaint in mid June. I don’t think that the officer assigned to the case has ever been out to see what is happening. It is amazing that Animal Control after showing their inability to deal with the pits that mauled the woman here in Littlerock, after all of the negative press, after all of the hand wringing by Antonovich, and even after the “hearing” at the City of Lancaster, they implement this very ineffective system for dealing with this. This is recent because just a year ago they would send out an officer right away to resolve the issue. I know because I was attacked and bitten by a stray dog when I was taking my evening walk over a year ago. They responded immediately. They picked up the dog and drove to my house to show me that they had captured it and they asked to see my bite to make sure that I was okay. Something has obviously drastically changed! They also used to come out and ask the irresponsible dog owners if they can prove that they have registered their dog(s) with the County. If they could not prove it then they were fined. This was very effective because many would just get rid of their dogs if they had not intention to register and spade, etc the dog. I have oned several dogs over the years and I learned from them that they are very sensitive to your absence from the property and they respond ofter with extreme anxiety. If people would just pay attention to their dogs, truly understand their anxiety, and try to reduce it as much as possible, then there would be much less of these problems. You are absolutely right! These people should not even be allowed to have pets. They do not care about them, they are not here to listen to these dogs barking incessantly for hours and hours…They go off to work at 1 AM and the dogs start barking as soon as they drive away. When I moved to Littlerock 10 years ago, I used to take my camera and go for long walks in the desert taking pictures. It was so relaxing. Now I am afraid to even get out of my car over on Mt Emma Rd or even at the park on Ave U. Contacting Animal Control is a joke. The response I got when the officer showed up in my driveway as I was returning home after actually going to the neighbors to complain yet again, was that there were procedures which had to be followed…meanwhile I am not getting any sleep for weeks on end. I have been tempted to just open the gate and take the dog away from them and take it to the shelter. I just find it hard to understand how people can be so inconsiderate of their neighbors and their pets. And I’m sure you’re just as ignorant as her owners… It’s my fault I walked my blind pit out at 1am to go to the bathroom. What was I thinking wanting to walk into my own yard while they sat in their dining room watching out the sliding glass door. Silly me. No, not ignorant at all and you are a rude woman to say that. I never said anything was “your fault”. Stop being a victim and accept the fact it takes all kinds of people to keep this earth in orbit. Just because YOU don’t like their dog looking over your fence doesn’t make that a bad dog. My point was, more often than not, a dog will respond favorably to kindness. Sorry, you are so bent on people feeling sorry for you and you enraging the pack mentality to come to your defense. Ig? look in the mirror. She sees YOUR face. Go chill out. People have the right to their opinions. Sure does have a right to their opinion, but they don’t need to call someone else ignorant for not agreeing with them. Maybe your face in the mirror. You must be awful sensitive if a comment about befriending a dog gets you stirred up! Lol look at the pictures – 1 am? Looks like daylight to me and its occurring consistently all the time. Dog is pretty stupid if it hasn’t figured out the neighbors yard isn’t his. And that my friend is dangerous. All of Lancaster is not that dogs right to police! And attack! Pitbill Arcade ..lock n load. Sounds like these people neglect their dogs. If they are out at all hours of the night, they are not socializing with their dogs nor socializing their dogs. THAT is a problem. The dogs are not at fault, the owners are. They are not teaching them how to behave around people, or other dogs. Their fight over food indicates the dogs are not being fed regularly. If they were they would not feel the need to fight over the food given. That is easily remedied, feed the dogs often and help them to understand food will be given often and readily. These dogs are obviously being neglected and abused which in turn will cause aggression. Not just in pits but ANY dog neglected to that extent are likely to become aggressive. 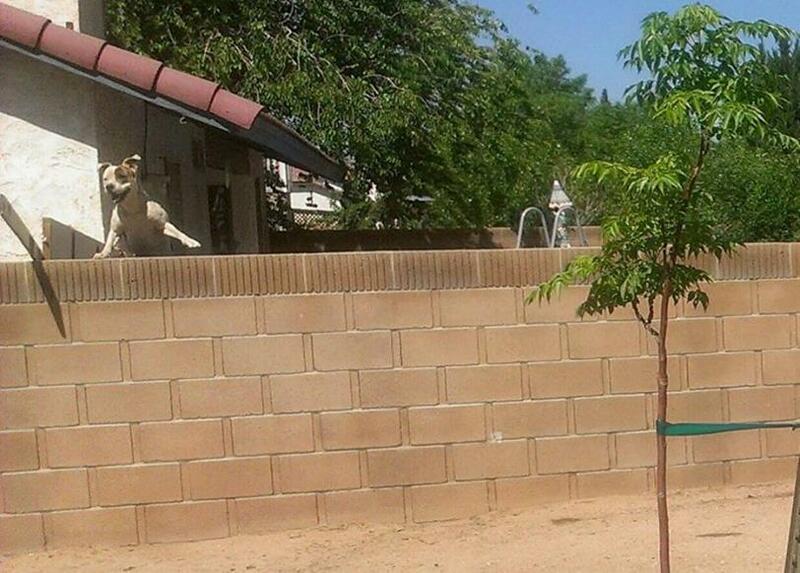 The fact that the dog is jumping so high to see over the fence is not really the issue. My own pit could scale the wall if she chose. However, she is just curious and loves people and wouldn’t jump over out of fear of what was on the other side. Pits are just like any other dog. Treat them well and pay attention to them and they’ll make excellent family dogs. All those stories you here about pits just “snapping” are because their families are not paying attention to their dogs medical needs. It’s more likely the dog has a brain issue that has gone unnoticed. Namely swelling of the brain or a cancerous tumor that has grown to the point of pushing the brain into the skull causing senility, which will cause fear aggression in both cases. I wish more people would stop and get the facts before jumping to conclusions about ALL pits. The fact is, there are way more dog bites going on out there that the media is not covering because they are not as sensational as a pit bull bite. I like what you have to say…..it’s true in everyway. Any dog will under these conditions acquire behaviors such as this. Thanks for pointing this out to the readers. Here is more of the story… I have lived here for over a year, I have had 2 pitbulls on this property. My issue is not with the dog but the owners. This dog is left outside almost all the time and she is looking for attention and she’s a pent up ball of energy. We haven’t done anything for so long because we feel bad for her. If you know anything about dogs, when they escape their property they usually aren’t themselves, so why do we have to wait and see what happens? When we asked the neighbors to work together to resolve this problem we were told, “what do you want us to do? We don’t lock up our dogs!” We were asking to resolve this problem because clearly if your dog bites you, you don’t have control! In June not that it matters, I was walking my dog outside because surprise… they do this thing called going to the bathroom. Not this this matters either but my dog was in end stages of addison’s diease & cancer. He was blind! Google the price of meds on an addison’s dog and that will tell you how responsible I am! He had special needs since 06, so I never have and never will leave my dogs outside alone. That’s why I don’t have worry about my own fencing. Another key piece to this story is I have Multiple Sclerosis. I have pit mixes as therapy/service dogs because they are strong enough to support me and they make me feel safe when I’m having a bad day. My babies have always picked up on how I’m feeling physically. Why do I have to worry that their dog is going to come into my yard and my dog is going to protect me? I can’t turn on the light to my yard without her jumping. I have nieces who’s parents won’t allow them into my yard because it’s even possible for the dog to come over. Which I agree with! I certainly can’t rake or use a shovel to empty things into my trash can because I don’t want to threaten the dog. I am heat intolerant, so yes you will find me outside at 2, 3 4 am. It’s my right, I work and pay bills! This is how accidents happen and everyone always thinks… oh no not my dog! Let me ask you this… How many of you would come over and sit in my backyard for dinner with this dog jumping non stop????? I once owned a male Boxer like this…. yes he was a big baby and very sweet with us, but a neighborhood terror. We changed his diet, took him to a dog behaviorist, obedience training, and even an electric shock collar. Had him in to the Vet, and it turned out he had a thyroid problem, which can cause aggression… so we put him on medication. He would get on top of the brick wall and growl and bark at the neighbors, actually bit one lady while I was standing right there, and had him on a leash. Nothing worked. Bottom line? I love my animals, but… we had him euthanized. RIP, Spike. Nobody should be mauled by a dog. Ever. I’m sorry for your loss ;( my last one we lost in August was diagnosed with Addison’s in 06. Our vet told us that since his adrenal gland would always be out of wack we may have problems with aggression. He was the opposite, a leaf could blow by and he’d hide behind me. I’m sorry yourbaby wasn’t as lucky. I live in the neighborhood across the street, If I look over the wall in my front yard I am looking directly at this houses backyard. I see this dog jumping ALL the time! I refuse to walk down that street. Clearly the fence needs another layer. I am just curious, what if the dog wasn’t a pit and say a lab or something, would the issue be any different? The point of making it a big bad pit plbull story is lost on me when clearly it is a bad neighbor story and should be a concern no matter the breed. It could be a 5lb chiwawa and my problem would then be.. ok your lil dog gets into my yard and my pit attacks it, now I have animal control targeting my dog as an aggressive dog. the main point is irresponsible owners! UNFORTUNATELY HERE IN THE AV WE HAVE THE WORST ANIMAL CONTROL IN LA COUNTY, DONT BELIEVE ME? ASK THE DEPUTIES THEMSELVES, JUST YESTERDAY (TUESDAY) A DEPUTY APPARANTLY HAD TO EUTHANIZE A DOG HIMSELF SINCE HE WAITED FOR OVER TWO HOURS FOR ANIMAL CONTROL TO SHOW UP AND PICK A DOG THAT HAD BEEN HIT BY A CAR AND WAS SUFFERING. SO IF LAW ENFORCEMENT DEPUTIES DONT GET THE HELP THEY NEED. WHAT CAN A REGULAR CITIZEN EXPECT FROM ANIMAL CONTROL? I am so sick of all these comments about hating on the pit bull breed. Stop being so ignorant and educate your self before you make a fool of your self. You really think its the breed and not the people to be blamed. The world is the way it is because of close mind people. Just because your scared or don’t like something it doesn’t atomatically become bad or dangerous. Looks like my yard. There’s a pit next door and it got in my yard and l told them next time, no more dog. Be very careful but check against the fence on their side. They may have something the dog can climb on and get over. If the shelter won’t come, call the city. There are laws. Go to the gun shop and get some good pepper spray, not Big 5. I would just shoot it if it comes over the wall and you sound just as bad buying a pit, they can be wonderful dogs and sometimes they are lousy dogs and sometimes they just snap! I lived in Lancaster since 89 and 6 months ago I said enough is enough and left that crappy soon to be Compton.What is wrong with getting just a Labrador? Why do young people have to act like ghetto trash get all tatted up get a pit wear their pants down to the ankles? Moved to Central Oregon love it here people actually wave to the neighbors and I haven’t seen a pit yet! Shoot it really? Yes if you are being attacked but not to just shoot it. Happy you moved out of California. Sounds like you were one of the ones to make it like Compton. Seriously stop hating on pit bulls and stay in Oregon. This world is full of close minded people and you happen to be one of the. What do tattoos have to do with bad people? People like you are the reason there is so much hate in this world. Boy are you a mean spirited person. I don’t blame him/her for getting out of this hell hole. They were right on, with the way this place has changed. They’re just venting. If my family didn’t live up here, I’d move too. Back to those dogs. My granddaughter has two and I won’t visit unless they’re outside. She wants to rent my house. Not unless she gets rid of them. Why are pit owners so on the defensive? They know they’re evil dogs. Now there is ignorance! I, having lived in places that people from Inglewood and Compton fear to go, can tell you that your opinion on tattoos and what constitutes the ghetto is so far from reality about Lancaster, I’m grateful you left. I can sympathize with the desire to see people NOT showing their grubby boxers as they walk, but those are the minority here in Lancaster. Since you don’t actually live here anymore, I can’t sit down with you and have the number of people dressed normally and abnormally tallied. By the sound of things EVER Lived in or near a ghetto, nor do I think you’d be brave enough to go into one willingly. Merely passing through at high speed with the windows up. Life is what you make it, and you can either work with the law and people to try and make things better, as Mary is doing by raising, or you can chicken out and run while casting aspersions behind you. My family and I are happy here, safer here, and grateful for people like Mary being concerned for ALL of us. When we had another inconsiderate neighbor who left her little dog out side every night while she went to work, the dog would bark non stop all night long. It was probably terrified of being left in the dark all alone. It took me many emails, filling out forms and phone calls to Animal Control before somebody finally came out to talk to them. It was only after I had spent yet another sleepless night that I sent a nasty email to Animal control at 4 am about their lack of action, that they showed up to reprimand me for my nasty email…My Husband was so upset, he went out at 3 am to yell at the neighbors to shut up the dog. They pretended they didn’t know who owned the dog even though it was on their fenced property. Some people should just not be allowed to have pets! Sounds like your neighbors fall into that category also! That is beyond the point! friendly or not, the dog should not be able to jump the wall. That needs to be fixed. Thank you Kat for your comment. I too, think she should talk to that dog. He probably just wants some attention. He if wanted to come over to her house, he would have. It is alarming when you see a pit jumping like that, but they are trying to see what it on the other side of the fence. A “hi Baby” and a dog treat in the morning can make a lot of difference in a dogs life. I would never get that close. How about that lady who owned her loving friendly pit and it had an attitude and bit off her nose. You never know what a dog will do. Never feed someone else’s dog. That’s asking for a lawsuit if the dog got sick. Never do it! A friendly “hi puppy” as you toss a dog treat is not feeding the dog. Working with the neighbor is the best idea. When a dog knows you and you speak to them, they quiet down. You don’t have to pet the dog or get close enough to get bit, if that’s what you’re afraid of. I have encountered many big dogs in my neighborhood. Having my dogs behave regardless of what the other dogs are doing is important. My dogs have accepted many strays while we look for their families. The dog behind you needs a little bit of attention. Pits respond very quickly to love and tenderness. Not on your life will I get close to one of those devils. If it comes in my yard, I will try and mace it. If that doesn’t work, then the alternative. I can’t for the life of me understand why people want these animals other than to show that they’re tough. I can understand why a gang banger wants one, but not a civilized law abiding citizen. Ah, only in the AV!! While I can understand where you are coming from, there are a few things I want to point out. Why should a resident have to give treats that they spent their own money on, to pacify a dog so that they may feel safe within their own back yard? Further more, as a pet owner of dogs who have sensitive stomachs, I would ask that my neighbors DON’T give my dogs anything consumable, unless they want to clean up the vomit afterwards. I understand that the dog may have needs, but again, the person who is in fear does not own the dog, nor does she have any say in the dog’s care or residence. Why should she be the one to give it the time and affection the owners should be providing? How can we be sure that the dog in fact has all of its immunizations? This is not a matter of breed. This is a matter of being able to feel comfortable in one’s own backyard. Yes, dogs get protective of their pack, and their territory. This is not an excuse for the dogs to be able to terrorize the people that are not within the bounds of their ACTUAL territory. I’m not going to comment on the owners specifically, because I do not know both sides of the situation. All I am focusing on, is why Mary should not be forced to engage the dog at all. I doubt the earlier comment of “stop messing with the dog” has any relevance in this situation; I’m certain she just wants to be left alone! Treating the animal may just give it more incentive to jump expecting more treats. Why am I not surprised at your comments? The pack mentality is alive and well in the AV. I hope the situation with this poor dog gets handled in a positive way, with the dog not being harmed. Good luck dog. Be careful of all these angry people. It is not safe nor her responsibility to get to know an aggressive dog. She has the absolute right to be safe on her own property and it isn’t her job to rectify the situation, bur the dog owner’s. Exactly. I personally do not wish harm on the dog. The only thing I would ask to see is that the situation changes so that EVERYBODY can be safe… Humans and dogs alike. It sounds to me that the only thing this dog has done is jump up and peak over the fence and maybe some slobber flew over the fence in the process. Did I miss something? You dont understand that, that dog can possibly jump that fense and do damage to little kids. possibly kill a kid! I am a pit owner myself, and my dog is super friendly, but if my dog was doing this, I would understand why my neighbors would be scared. I have a 1 year old child, and I personally would be super scared of my neighbors wild pit being near him. Dog is like 1 inch away from getting over that wall. They just need to add another layer of bricks! not that hard to do. I called the city about that and you have to have your neighbors permission. I’m just going to put up lattice. Nope just another person fuled by the hype of “evil” pitbulls. I find it interesting that this woman has been so scared of this dog but yet in her statment even admitted she was next to the wall at 1am. Shes scared of getting injured but willing went to go next to the wall in the middle of the night. The first photo only shows an excited dog jumping up to see someone and get some attention. Look at the smile on that dogs face. I cant believe this story even got published. She complaining animal control wont respond to a dog jumping up on a wall, the dog never left the property, but animal control needs to spend their time on this call? Maybe instead of blaming animal control about not amswering your call you should complain to the mayor who refuses to fund any more animal control officers in the city of lancaster. Because of him refusing to fund there is only one lancaster animal officer on duty at a time, which means when you place your call if they get another call about an injured dog in traffic or a vicious dog RUNNING LOOSE it trumps your call. In other words take your problem to the mayor. And stop conplaining about a dog jumping. Thats just ridicilious. Dogs jump and run and bark. Just as kids will run and jump and yell while they play. Should we call the cops because kids jump up at walls? If you read my other responses, I had a blind pitbull who was going to the bathroom. He used the wall as a guide around my yard. Have u ever seen a dog turn in a circle a few times before he poops? So I should have to allow my dog to walk into a wall because some one can’t control their pet? Lol you and my neighbors are the exact reason why idiots shouldn’t have pets. I have hundred of videos & pictures showing this dog is not smiling. This story was run because of the story the day before. Just like the family who allowed their German shepherd into a stressful environment and an attack happened. Now that poor dog will be put down… But clearly I’m responding to someone who knows nothing about dogs. I would consider getting something stronger than a taser if I was you. That is scary!! 2 homes next to each other with Pitbulls, what could possibly go wrong? I notice the person says the neighbors dog hasn’t jumped the wall yet… but if it does it will be able to get out of their yard into the neighborhood… meaning that their own pitbull can get out into the neighborhood..
Just to clarify for you Sir.. I am a responsible pitbull owner.. never have and never will leave my dog out alone. First I would never want anyone bit on my own negligence and second the speed limit is to high out here and I live by a busy street. I grew up in Massachusetts with space & land. When we moved here in 2001 a thunder storm freaked our family Labrador out and he was killed by a car. The story is kind of lost on the pit part.. not so much the taking responsibility part and what damage the strength of any dog but especially a pit can cause. I grew up breeding labradors but fell in love with pits when I worked at raining cats & dog kennels. Quick question, why were you out in your backyard at 1am? Not excusing the dog, but maybe it was really curious about what was going on it your backyard in the wee hours of the morning? Did you really just ask somebody what they are doing in their own back yard at 1:00am? What difference does it make what they are doing in their back yard at 1:00am, that is absolutely none of your business or mine. Thank you Patty! I actually have medical issues & I can’t spend 5 mins in the sun. @ PALMDALE RESIDENT….They were in their yard at 1am to see what the yelling was about from the neighbors house…it’s in the story. The dogs were fighting over food! On that note, no one should live in fear in their own yard. It looks like the neighbor is taking some precautions, but they don’t look to be substantial to keep the dogs in their own yard. No, the story states that in April they ran out to the yelling. In June, they were in their backyard at 1am.